I’m a bit behind in getting my wrap up and thoughts on Sage Summit–Sage’s annual event for business partners and customers–together. But better late than never! As you can see in the related links at the end of this post, I’ve attended these events for many years. During this time, Sage North America has gone through many significant changes to bring sharper focus to its mission and more value to its customers. At this year’s event, I saw promising signs that these efforts are beginning to pay off. Sage North America has been on a transformational journey since 2009, when Sue Swenson took over as CEO, made some tough choices, and began setting the wheels in motion to change the company’s downward trajectory. In the four years since, the company hired another new CEO, Pascal Houillon, in 2011. Under his leadership, Sage made some controversial (at the time) moves to unify the Sage brand and product names and divest Sage of seven non-core businesses, including ACT! and SalesLogix, which had large installed bases. To help streamline the company’s focus on its core business and on improving customers’ experience with Sage, Houillon also brought some fresh talent into the executive ranks. Continue to focus on its core businesses (accounting, payroll, payment processing, ERP, etc) for very small businesses, SMBs and the midmarket . Key to executing on this is the company’s move to centralize R&D Centers of Excellence for cloud, mobility, customer experience. In the past, each individual product brand would undertake separate development efforts for new functionality. Now, Sage R&D develops new features, extensions and add-ons once (for mobility or analytics, for instance) that individual product groups can replicate across their solutions. Sage is also in the process (though not yet there) of standardizing service and support offerings. It launched Sage City, a new centralized online community for customers, business partners and employees, last month. And, Sage will make new acquisitions when needed to supplement its core solution focus. Expand its connected services strategy and offerings. 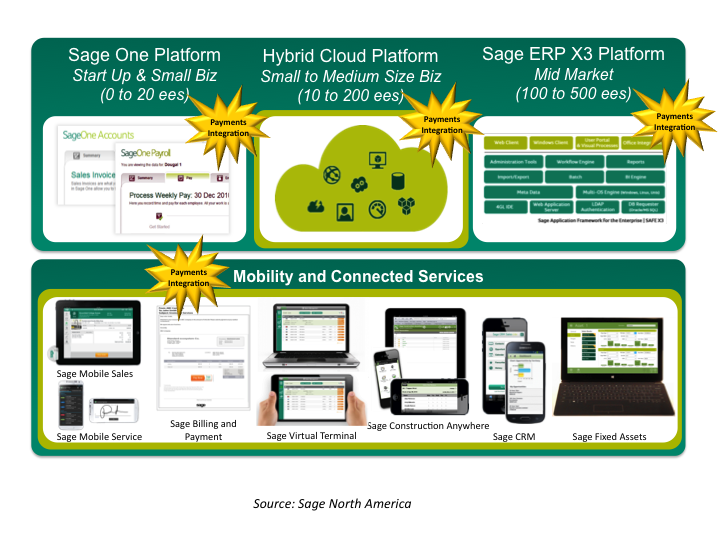 Sage is building more cloud services, such as SageExchange.com, Sage Mobile Sales, and Sage CRM, that connect to core financials and ERP solutions, as well as for partners to build and sell add-on connected services. The company’s big picture vision is to “liberate” data and services that had been locked into ERP so that customers can use them in the cloud, anywhere, anytime, and from any device. Sage is building a data cloud on Microsoft’s Azure platform with common connectors, bi-directional synch, multi-tenant storage and disaster recovery. This means that Sage connected services will work the same way regardless of the backend ERP/financials Sage customers use. This will all come together in the Sage Marketplace, slated to launch in FY14. Going all-in on the subscription pricing and the cloud. Sage now offers subscription-based pricing for all of its solutions, and comps partners on a percentage of subscription sales over the life of a contract. It has also committed to developing cloud versions for its solutions, including a cloud version of Sage ERP X3, which will feature a user pure web experience when available in 2014. The Sage commitment to putting customer experience first underpins these initiatives. Sage has several initiatives underway to up its listening game, such as the Sage Listens RV Relay, which is allowing Sage to also kick off a “Shop Local” campaign to encourage people to shop with local businesses. In contrast to the “build it and they will come” tack that most tech companies take, Sage is taking its cue from the Proctors and Gambles of the world. It is getting customer input upfront before developing new products and functionality. Sage is hearing that customers want easy to use, flexible solutions, mobile capabilities and a low-cost of entry, and is concentrating resources on these areas. In fact, in one of the breakouts, when an analyst asked a Sage executive about social and big data plans, the exec said that customers are not calling these out as priorities. He added that while Sage isn’t ignoring these areas, it is prioritizing development and marketing based on customer input. For instance, Sage recently launched Sage Healthcare Advisory Services , which includes a new “My Workforce Analyzer” tool to help SMBs understand plan for the Affordable Care Act. Analytics are under the covers, of course, to help SMBs develop what-if scenarios and optimize planning. But Sage isn’t calling it a big data solution. To that end, Sage demoed a voice-to-text initiative in which users can use voice-activated mobile technology to interface with ERP systems on mobile devices. It’s sort of like Siri, but within the context of the business and business workflows, so it appears to do a better job of handling user queries and requests. While the voice command initiative is in its infancy, it could be a key differentiator in the future. Finally, Sage is putting its money where its mouth is, by tying Sage metrics and compensation for all Sage execs to Sage Net Promoter scores (NPS). The company’s previously shrinking North America business has grown 4% year-over-year. SMB Group research shows that accountants/CPAs and technology business partners represent 2 of the top 3 influencer channels for SMBs selecting financials and related business solutions, with peers in other businesses rounding out the list. Sage has a large channel in both areas–with over 25,000 accountants in North America and more than 26,000 technology reseller partners worldwide. But over the past few years, cloud competitors have been trying to poach these very valuable resources. Partnering with the Business Learning Institute to develop a curriculum for accountants to help them provide more competitive services to their SMB clients. Planning to launch a new certification program for accountants focused on startup market, with a collaborative version of Sage One, Sage’s solution for very small businesses, to make it easier for them to automate tasks and take care of clients. Introducing the Sage Advisor Partner Dashboard, which uses current customer data to help Sage reseller and accountant partners more readily identify new opportunities in the installed base, and provide a more personalized, consultative sales experience. Sage is also recruiting new partners for midmarket Sage ERP X3, and new accountant partners to help it build traction among very small businesses for the Sage One solution. Minus ACT! and SalesLogix customers and partners, this year’s Sage Summit was smaller than in 2012. But, the energy level was much higher. Sage executives were more confident and relaxed, and the messages they delivered were consistent and crisp. Sage demos were more engaging, and even at times, entertaining. Key metrics, including rising NPS scores, modest growth in its North America business, and a stock price that recently reached its highest point in 13 years are also good signs for Sage. As important, conversations with customers at the event led me to conclude that “Sage Listens” has moved beyond a slogan to put the programs in place to proactively engage customers. Sage One marketing. 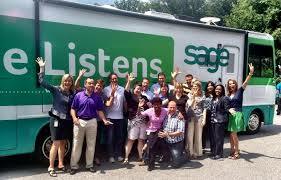 Worldwide, Sage has about 10,000 customers using this very small business management solution today. But most of the millions of very small businesses have never heard of it. Sage needs to significantly enhance awareness and demand gen campaigns to become more than a blip on the radar. Third-party connected services . Sage has a big installed base, which should make it an attractive partner for third-party developers–especially now that developers can write just one connector and reuse it for all of Sage’s core products. But Sage has only about 20 endorsed connected partner services today. Again, many developers don’t know about this opportunity. Sage must raise its overall visibility in the developer community and launch a targeted recruitment program to get developers to build the apps that its customers need. Clarity around CRM. After divesting ACT! and SalesLogix, the company’s sole solution here is Sage CRM. But other than discussing integration and a cloud version of Sage CRM that is in the works, CRM was very low profile at the event. Given Sage’s focus on core financials/ERP it leads me to wonder how committed is Sage to Sage CRM, and if will make the investments required to provide a truly first-rate CRM solution. Innovation. 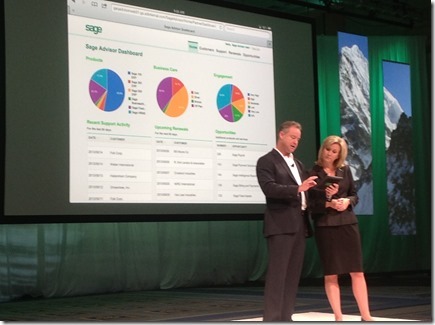 Sage made a good case for its direction in the cloud, mobile and integration areas. However, analysts and press did and will continue to hound it on social and big data/analytics. While Sage customers may not have put these areas at the top of their priority lists yet, it’s only a matter of time before they do. Sage needs to get out in front in these areas. That said, it’s challenging to do everything at once. The Sage leadership team has made the decision to move forward instead of standing still. All in all, I get the impression that Sage as a company has a better sense of who it is, where it’s going and how it will serve SMBs. Next Next post: SMBs and Analytics: What Don’t You Know? You will see a continued increase & interest in Sage CRM as the years progress, that’s for sure. You only need to scan the analyst & business trends threads around the web to know CRM will eclipse most business software spends within a few short months. It’s all in recognition that a business’ most valuable is their customer. And #CRM must be as a foundation. Laurie, as usual you have done a nice job in your article. However I must disagree with some of your observations. In fact The More things Change ….., may have been a better headline over the current one That was Then …. Starting with your comment on “fresh talent”. Besides replacing Laurie Schultz, the current team is comprised of pre-Swenson Sage veterans from the days when Sage products were market leaders. The reality is that Sage missed the opportunity to bring in fresh talent when founder Paul Walker retired as CEO, and it lost whatever fresh talent it had brought in during the last few years, with Sue Swenson’s departure. Second, with respect to rationalizing the “unfathomable” number of overlapping products. I can’t imagine that selling off 2 CRM products makes the Sage portfolio any more or less rational or unfathomable than it was before? It is too easy to rationalize the historical non-performance of these Sage business units by saying that there were too many and overlapping products and that is what made them perform badly. The fact of the matter is that each product was a market leader when Sage purchased it, and each was eventually overtaken by a more nimble competitor. It was not cannibalization that did any of the products in. It was lack of execution. Third, I am especially intrigued by the statement that “it is now unacceptable for Sage executives to position the Sage portfolio in different ways”. What does “in different ways” mean? An example of two may be helpful. Was it ever acceptable for Sage executives to “position the Sage portfolio in different ways”? Fourth, pulling R&D out of business units and consolidating them is under one umbrella is a really bad idea if you want to drive innovation, and innovation is what Sage desperately needs. This consolidation is only about one thing, cutting costs and driving margins. Not at all about the top line, new customers etc. I predict that R&D will be back in the business units in the next year or two. Fifth, the connected services strategy, Sage Cloud etc were enumerated in 2010/11. We are almost at the end of 2013. Two plus years is an eternity in this business, yet there is precious little to show for all this time. A focus on rapid execution of key initiatives, via small steps taken quickly, is needed. Sixth, with respect to the Sage exec who when questioned about social and big data plans said “ the customer are not calling these out as priorities”. This is a telling response and one which points to the core of the problem facing Sage and other large companies. Large companies know how to farm existing customers and markets, making incremental improvements in offerings, but usually don’t know how to hunt for new ones through radical innovation. In his book The Four Steps to the Epiphany, Steve Blank highlights this difference (page27) “big companies tailor their Product Development to know customers. Product features emerge by successive refinement against known customer and market requirements”. In the case of startups however “Product features emerge from vision”. Sage and other traditional publishers need to figure out how to farm existing customers so to speak as well as hunt for new ones at the same time. Easier said than done. Seventh, with respect to the Channel. In the few months since my company Versaccounts http://www.versaccounts.com (blatant plug) announced their mid-market cloud ERP offering, multiple top-tier Sage and other publisher VARs have reached out to me (completely unsolicited) to explore a possible relationship. The common theme around why they are looking for partnerships beyond their existing publisher has been the sorry state of their relationship with that publisher. Not the lack of products, or services. Not lack of cloud offerings. Improving their relationships with their channel partners may be something publishers should work on over announcing new partner programs and recruiting new partners. Finally, it goes without saying that there are a lot of smart people at Sage (several are now on my team at Versaccounts, and I hope we will have several more join us in the months to come) and given a chance I am sure they will easily get things turned around. The challenge is to identify these people and give them the room and resources to get the job done. For a great article on the role of leadership in doing just that take a look at this interview with Laurie Schultz, now at ACL, in the New Your Times. http://www.nytimes.com/2013/08/30/business/laurie-schultz-of-acl-goes-looking-for-the-leaders.html#! Thanks for reading and for your perspectives! I’ll certainly welcome Sage to weigh on in your comments in more detail, but here are my thoughts on some of your comments. Fresh talent: Joe Langner, Brad Smith, Doug Lebahn are a few of Pascal’s hires I’m referring to who are reshaping Sage’s strategy. Products: In addition to selling off the CRM products you’ve mentioned, Sage sold the Nonprofits portfolio and healthcare solutions, and has identified core and noncore products for future investment. Positioning the portfolio in different ways: Yes, I used to hear very different stories about product positioning from different parts of the organization. Agree they should have been– but they were NOT on the same page with the big picture story before. This year, everyone positioned the portfolio consistently. R&D: My understanding is that R&D is centralized to ensure 1) consistent user experience 2) make it easier to roll out of new common capabilities (e.g. mobile) more easily. I believe there will still be development going on in individual groups, however. Social: I agree with you there, as I said in the post, Sage needs to be ahead of its installed base here. Channel: Its always a mixed bag with partners! Some are very loyal to Sage, and others are dissatisfied and want alternatives. But my impression from the partners I spoke with at Summit were that they felt positive about Sage’s new strategy.